The Amazing PhraseBook That'll Have You Speaking Conversational Thai in Seconds! “A must have for anyone who can't wait to start speaking Thai” ~Bangkok Post. Now you can start speaking Thai immediately, with the revolutionary book that breaks down the barriers stopping you communicating with locals. Learn everyday colloquial phrases that will advance your Thai language skills faster than any language school or translation dictionary. Coming to Thailand for a holiday? Thinking of settling in the Kingdom? Want to communicate better with your Thai partner? A Phrasebook Like No Other! Until now there has never been a Thai phrase book that accurately reflects the way Thai words sound. In addition to this, the complex Thai 5-step tonal system has made it near on impossible for foreigners to make fast progress with learning the language. Along with the incredibly complicated Thai alphabet, this usually makes most quit before they've really learned anything! But with 199 Everyday Thai Phrases you don't need to worry about learning the tones because you'll pick them up as you learn-on-the-go speaking with Thai people. It's so simple! 199 Everyday Thai Phrases is based on a learn-as-you-go “phonetic hacking system” that gets you speaking with locals immediately. The concept is real life immersion that leads to real life conversation, from which you will naturally progress to learning proper tonal pronunciation through social interaction. All the phrases in this book can be said immediately just by reading them as you see them in English. You don't need to be good at languages, and you don't need to know any prior Thai. Anyone can start speaking Thai immediately. Learn Thai Phrases People Actually Use! The problem with language schools is that you feel like you're making great progress until you try speaking with locals. You then realise that “have you ever seen a rainbow” (yes that was what they taught at my Thai school) isn't a common thing Thai people say. 199 Everyday Thai Phrases has the “Thai” seal of approval for everyday conversation, which means all the phrases and words have been user-tested to ensure Thais understand what you're trying to say. Start Speaking Thai Right Now! 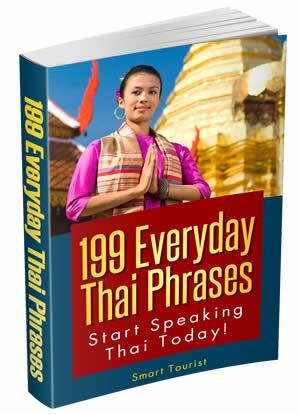 199 Everyday Thai Phrases is a reliable, portable and easy-to-use phrasebook that ensures the right choice of words will always be at your disposal in everyday situations. From taxi directions to passing chitchat, this indispensable phrasebook will become an essential companion during your time in the Land of Smiles. ✓ Go beyond a simple “hello” and make friends with locals. ✓ Get directions, shop, and eat out with ease! ✓ Learn numbers, dates and time in seconds. ✓ Effortlessly navigate difficult situations. ✓ Speak confidently and make sure you're understood! Download Your Copy Instantly For Just $5.99! 199 Everyday Thai Phrases comes in an instantly downloadable PDF format that can be used on all your digital devices, including iPad, iPhone, Android phones/tablets, Mac and PC computers. Kick-start your enthusiasm to learn Thai, and get a massive head start on others who are struggling with dictionaries and language teachers. Also available here on Kindle. P.S. Includes a bonus ‘easy to learn' section on Numbers, Days of the Week, Months & Colors.